Its time for our Guest Designer of the month and guess who do we have here? Ta da!! 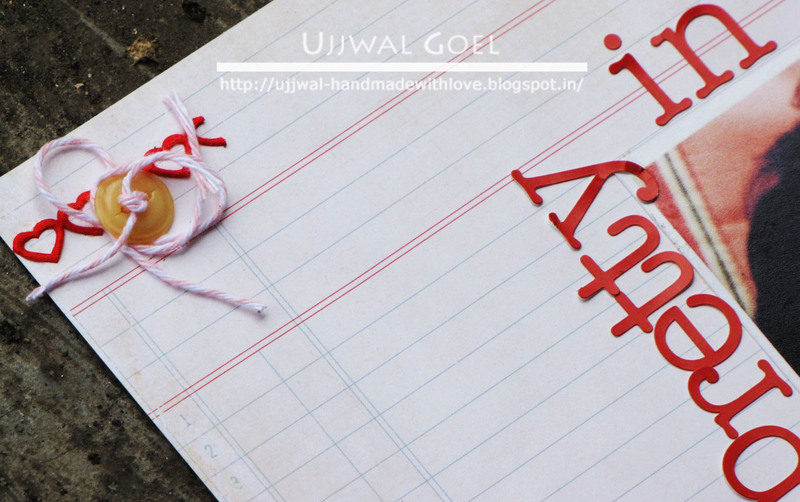 We have our very own Ujjwal Goel back up and crafty. Ujjwal was MIA as her little one kept her busy but we are amazed how well she has been able to balance things for herself and been generous to do a Guest design post for Lulupu.com. I’m Ujjwal living in Pune, India. I am a software engineer turned Stay-at-home-mom to a 3 month old. 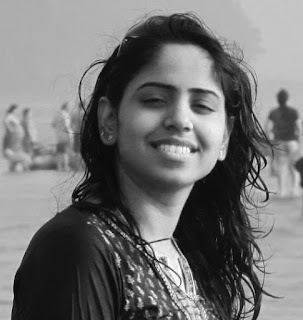 I have been into card making and crafting since I was a small kid but it got serious when I discovered blogging three years back and started my own blog and there has been no looking back. I have met some very talented people, made wonderful friends and learned a lot. I love creating and exploring different forms of art but stamping is something that has stayed with me though all my experiments and adventures in crafting. My style of crafting is more towards clean and simple but I love trying out different techniques once in a while. 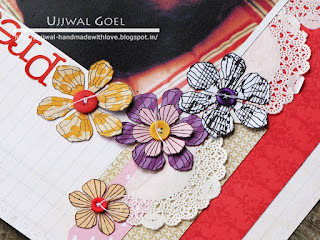 Off late I have been enjoying making mini albums and scrapbooks. Having a little baby around makes you want to do layouts and make albums. I simply want to preserve every little moment with my daughter and be able to look back later. And that is what brings me to today’s project. When I was given a choice to pick from a row, column or diagonal from the challenge grid, I promptly picked D2 (Pattern Paper, Paper Piecing, Twine/Ribbon/Lace, Photo). This diagonal had all of my all time favorite things to play with. And here is what I created. 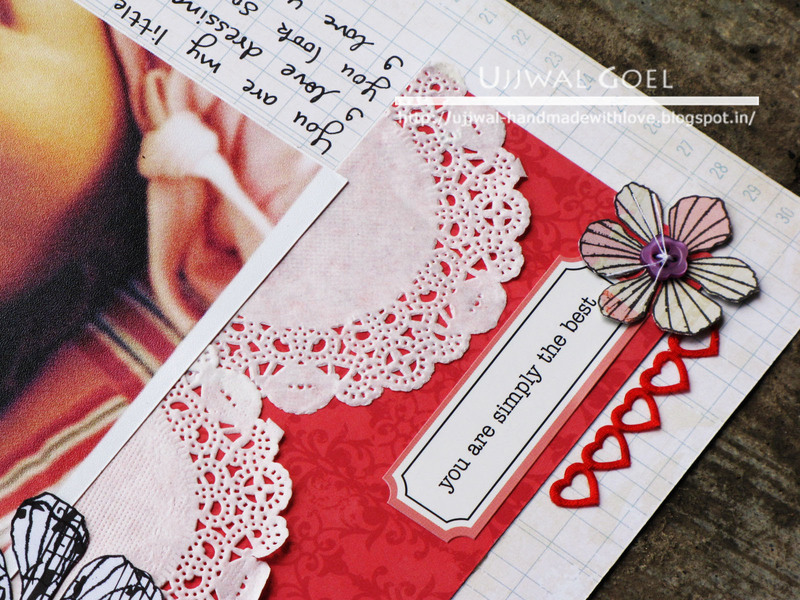 A peek at the gorgeous heart trim and journaling. And here my little corner accent with twine, trim and button. I had so much fun making this layout and I hope you will feel inspired to try a layout for Lulupu’s current challenge submission. Looking forward to see what you create! very pretty layout! 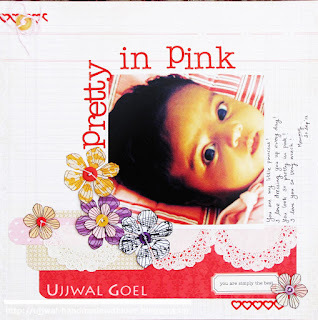 Love the use of doilys cut into half and little Aadya looks so cute! lovely layout.....daughter is fairy,love to her. all the elements are nicley incorporated in this LO..the blooms are gorgeous !! Oh my gosh! this is such a Gorgeous Lo Ujjwal...Your little Aadya looks a darling in pink :)...you have embellished this LO so beautifully..love the paper pieced flowers and those hearts accent! !...what a lovely inspiration!! !